The following is a transcription of a talk I gave at Staffs Web Meetup in October, 2017. I share some of the lessons I’ve learnt during the first 3 years of running my business. You can view the slides here. Before we dive in, I’ll start with a little background about myself. Prior to going freelance, I worked at a digital marketing agency for several years. It was a small agency of around 8 folks. When you work at a small company, you really have to roll up your sleeves and get stuck in. While I was technically employed a frontend developer, I also managed projects, wrote proposals, pitched to clients, and so on. All these things are, of course, great experience for when it comes to running your own business. And while I mostly enjoyed my time at this agency, having worked with great colleagues and on interesting projects, I always had this urge to go freelance. What I wanted was the freelancer’s lifestyle: working in hipster coffee shops, or working on the beach, or playing PlayStation whenever I felt like it. Or at least, this was my perception of what freelancing would be like when I was looking from the outside in. Freelancing was the dream. Why do people go freelance? Well, some of the reasons include: no boss(! ), you could potentially earn more money, you can pick your own clients, and you can work when and where you want. This can be summed as simply wanting freedom and control. This is certainly why I started my own business. I wanted the freedom to work when I want, to control who I work with, and so on. I wanted autonomy. After several years of agonising over the decision, I eventually quit my job and went freelance. So – how’d it go? Well, my first year was good. Really good. I made more money than my previous full-time salary. Worked turn up when I needed it. I worked on some great projects. It was, dare I say it, all a little easy. But my second year was different. Work dried up. I had several quiet months, which meant I started eating into the savings I had saved up. I took on some projects I shouldn’t have. And on top of all that, I overworked myself. I worked long hours, thinking that would fix the problem. I burnt out. I realised that I was lucky in the first year of my business. I had exhausted my network. And because work was coming my way, I hadn’t put in place the required processes to help my business grow. I was making the classic mistake: waiting for work to come to me. I’m now coming to the end of my third year in business. This year has been much better, both financially and mentally. But it’s the second year I want to focus on. It’s often the failures we have, or the bad scenarios in life, that we learn from. I didn’t learn much when things were going great. But during the second year I learnt a lot about my business and myself. So, I left my job for freedom and control. Did I get it? Well, not really. I’ve learnt that running a business is hard. At times it’s stressful and overwhelming. Freedom and control is not automatic: you don’t instantly get it the moment you start a business. In fact, the opposite is often true. It takes intentional planning and action. Today I want to share an idea with you. It’s perhaps the biggest lesson I’ve learnt so far. And that idea is what I call margin. To explain what margin is, I’ll use a car analogy. Let’s say you’re driving a car that goes 100mph at 100mph. You’re going as fast as the car can go and you’re putting stress on the engine. But now let’s say you’re driving the same car at 70mph. You’re no longer putting stress on the engine and you have additional capacity to go faster. Now you’ve some in reserve. And that’s how I think about margin: it’s breathing room. Margin impacts many different areas, but there’s 3 areas in particular that I want to focus on. I’m going to start by talking about money first for a reason. Many of us aren’t interested in getting super rich (if we were, we probably wouldn’t be freelancers). And we know that money doesn’t necessarily bring us happiness. But money is the backbone of your business. Without it, you don’t have a business. Money can also be a huge source of stress. This is common advice for starting out: have some reserves in the bank to get your started. The actual amount – whether that 3, 6 or 12 months – is up to you. It’s whatever feels right. The problem is, in the second year of my business I started eating into my savings and this caused some problems which I’ll get into. This money is the bank is a cash buffer. This is saving for a rainy day. How do you build up this cash buffer? We’ll, there’s 2 ways to think about it. There’s the top number: your income. The more you earn, the more you can save. You could take on more clients or projects, or increase your rates. There’s also the bottom number, which gets talked about less: your expenses. As freelancers, we can live frugally. We don’t need the latest MacBook Pro or a fancy office to work in. And so, the more we can cut our expenses, the bigger our profits, and the more we add to our cash buffer. Why is this cash buffer useful? It’s useful because you have to ready for dry spells. I’m sure many of you are familiar with this situation: you’ve got a good project on the go, so you put your head down, get the project out the door, send the final invoice and then… after looking around… realise you don’t have any work. This is referred to as the “feast and famine cycle”. Dry spells can hit any business, despite how good your sales pipeline or marketing might be. Quite often these dry spells come from factors outside of our control. As an example, in 2019, the UK will be leaving the EU. Who knows what will happen then? It’s likely that many businesses will be cautious with their spending. Often the first budget to get cut is marketing, which of course will have an impact on many of us who offer marketing services. Let’s imagine you have no money in your bank account and a potential project comes you way. You’re desperate for that project – you need the money. And what happens? The client can smell your desperation. You’re more likely to lower your rates or agree to unrealistic deadlines because you need that project. But now imagine you have a cash buffer. You no longer need that project. You now have the freedom to access each project and make a judgement call: is the budget sufficient? Can you do a good job in the time available? Will the project be fulfilling? Having a cash buffer puts you in a much stronger position and makes you more confident when negotiating, and quite often clients like and respect that confidence. We live in a frantic world, and it seems to be getting more frantic. Everyone is busy. Sometimes it can feel like we have to be working 14 hour days because that’s what it takes to be “successful”. But there’s a problem with this: overworking yourself isn’t productive, healthy, or sustainable. That’s why margin in your schedule is so important. “8 hours a day is plenty of time to get great work done” is true. And I’d add: 8 hours a day is plenty of time to run a business. But it’s the second part that’s more important: “if you have 8 hours to do that work”. We may sit at our desks for 8 hours, but how many of us are actually getting 8 hours of work done? We live in a world of distraction, with notifications pulling us in all directions. If we’re able to minimise these distractions and focus on the work, then we can get a surprising amount done in 8 hours. There’s an app I used called Focus. It’s available to download on the Mac App Store. I can set it to run for a set period of time, say 30 minutes, and it’ll close distracting apps such as Slack and email and block websites such as Twitter and Facebook. It allows me to focus on my work. There are seasons in business and in life. There are times when you should work hard. You’re coming to the end of a big project and you need a final push to get it over the finish line. Perhaps a few late nights are in order. That’s just part of running a business. But equally, there are times when you should take the foot off the pedal, when you should relax. As freelancers, we need to remember that we’re not trying to build the next Apple or Google. We’re trying to build good, dependable businesses for ourselves. That means resting. That’s a quote from author Austin Kleon. It’s that last part I like: know which season it is, and act accordingly. Know when you need to put your head down and put in the hard work. And know when you should slow down and rest. You need to allow yourself time to recharge and rejuvenate. Many of you have probably heard of Parkinson’s Law before. It states that work takes as long as you allow it. The problem with working 14 hour+ days is that you will always find work to fill it. Even if you work 14 hours a day, 7 days a week, there will still be stuff to do. Here’s an example. I occasionally take a Friday afternoon off, which leaves 4 hours in the morning to get my work for the day done. What happens? Those 4 hours are the most productive of the week. That’s because work will fit the time you allow it, so think about giving yourself less time. Simple things like having office hours, 9-5, are really important. Sounds obvious, but I didn’t have office hours for the first 2 years of my business. You need to set expectations for your clients. I don’t reply to client emails after 7pm. Or rather, I do, but I’ll schedule that email to arrive at 9am the next day. The problem with emailing clients at 9 or 10pm is that if you do it once, they will expect it. You have to protect your time. I have to constantly remind myself not to work all the time as it’s so easy to do. I work at home, I enjoy the work I do, I enjoy being in my office. So this is how I try and think about my day to stop myself from overworking. Take a day and then chop it into 3 chunks: morning, afternoon, and evening. My rule is to only work 2 chunks per day. Sometimes I’ll work morning and afternoon, or I might go for lunch with a friend and work morning and evening. What I don’t want to happen is work all 3 chunks. This should be the exception, not the norm. Sometimes you just need to go for a walk, read a book, or take a few days off. We often get our best ideas when we’re not at work. When we allow our minds to rest, we get our best ideas. That’s why we often get ideas in the shower. Resting actively helps our work, so there’s nothing to feel guilty about. Finally I want to talk about emotional and mental health. Many of us, myself included, are guilty of not giving this the attention it deserves. If you have margin in your emotional and mental health, it means you’re not living on the edge. You don’t get angry or upset at little things. When you feel stressed or tired or overworked, this is your body giving you a signal. Earlier I alluded to the fact I burnt out in the second year of running my business. What did I do? I dug in and worked harder. I tried to power through. I didn’t listen to my body and made it worse. The people you surround yourself with have a huge impact on your your emotional wellbeing and your outlook on life. There’s a saying you’ve probably heard before: “You are the average of the five people you spend the most time with.” So hang around positive people. People who inspire you. People you like. I started a mastermind group several years ago. A mastermind group sounds fancy, but it’s simply 4 business owners who chat every 2 weeks about business: things we’ve learnt, things we’re struggling with, and so on. The reason I set up this mastermind group is simply to surround myself with the right people. These are people I look up to and learn from. They’re also people in my shoes, running businesses just like mine. This sounds simple, but it’s not easy. If you can get this right, everything else becomes easier. You’ll enjoy your work. Get this wrong, however, and you’ll be miserable. Earlier we talked about having a cash buffer. If you have a cash buffer, you can turn away the projects that don’t interest you. Back to this idea of freedom & control. You have to be intentional about the way you run your business and your life to get freedom & control. Margin is what enables you to get freedom & control. With margin in your finances, you can avoid that bad client or project. If you have margin in your schedule, you can take that 4-day weekend. If you build margin into your emotional and mental health, you’ll be a better spouse, a better husband, a better wife. And you’ll develop deeper relationships with the people that are important to you. This all adds up to making you stronger, which in turn makes your business stronger. It’s important to say that building margin into your business and life is a long journey. It doesn’t happen overnight and I certainly don’t have this sorted. Why is margin so important? Because as a freelancer, you are your business. Everything rides on your emotional and mental wellbeing. If you break down, your business breaks down. You have to put yourself first. There’s a saying in business: if you don’t run your business, your business will run you. It’s true. Implementing margin is a way I’ve found to give me the time and energy to run my business. Your number one job as a freelancer is to think about your business. That sounds obvious. But how many of us actually do that? We should be asking deep questions like: Are you working on projects you enjoy? Is the work you’re doing fulfilling? Are you attracting the right kind of clients? Now all this advice probably sounds self-serving. Shouldn’t you be thinking about your clients? Shouldn’t you be thinking about working on projects that make the world a better place? Well, yes. But the way you serve others is by first serving yourself. If I’m happy… If I’m working with people I like, enjoying the work I’m doing, and working in environments I like (my office, co-working spaces, etc). If I’m healthy, both physically and mentally… if I’m exercising, eating well, sleeping well, meditating and journalling. And if I’m being productive… If I’m doing Deep Work, working with distraction, and focused on the right things. Then this to me is the foundation of a successful freelance business. 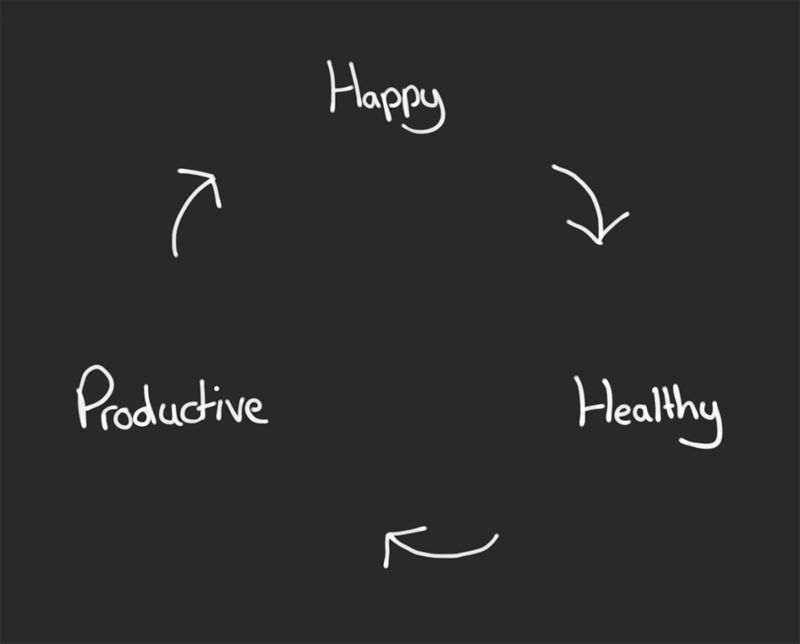 It’s a virtuous cycle: each feeds in to the next. And so my best advice is simple this: look after yourself. This was a transcription of my talk “Building a successful freelance business without going crazy”. The slides can be found here. What is the smallest step you can take?